So, what better way to kiss and make up, than to share another how-to with you guys. And this one has already been on my to-do list since forever. I have always wanted to share how I did Hannari's hair since the feedback was so positive! So you see that the 'do could last a good few months. I didn't invent this one. I just practically copied a certain process of doing an afro hair on a doll. 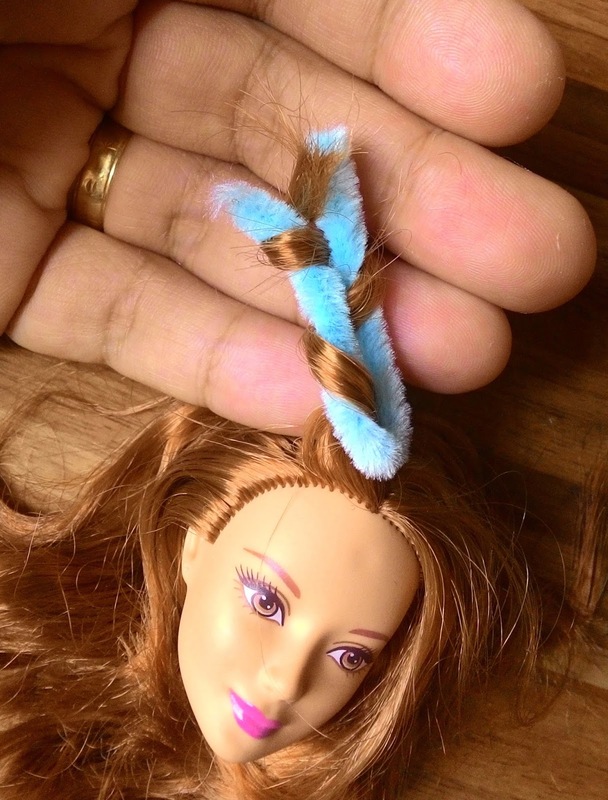 How to make your Barbie doll Afro-licious! I followed everything except I made my twists just a little more loose for Hannari. She recommended we use 2-3 inch-long tube cleaners, like the one below. 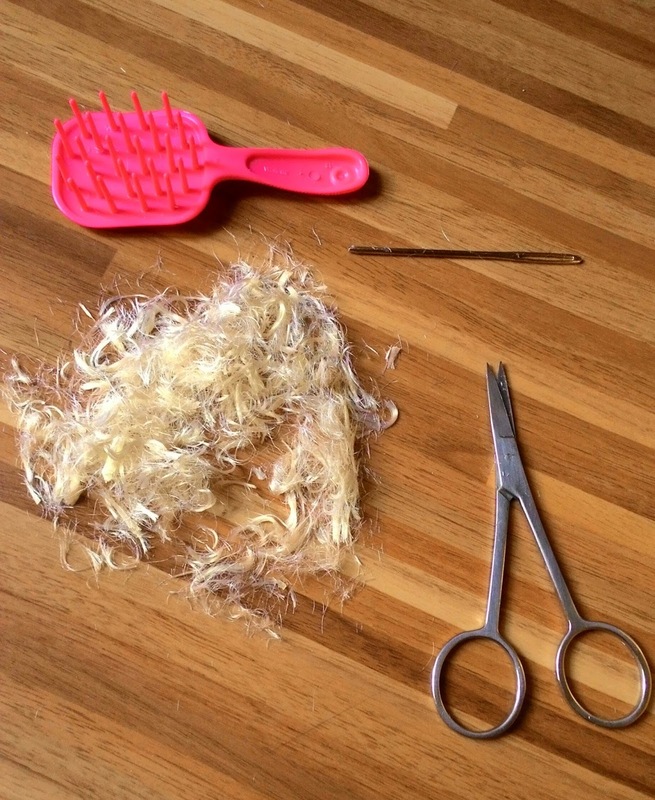 Twisted hair sections intact, before the boiling water treatment. And naturally, I forgot to take a photo of the boiling water dip stage. Some photos here, and this, for reference, just in case. Then, I left Hannari's damp, secured hair dry up overnight. I was thinking so hard minutes ago what that big fat needle was for. Darn, I still can't remember that the needle was for. I guess to take some strands neatly without scrambling the other stands with my fat fingers? I remember seeing hairstylists do this with their pointy-end combs. When I do remember, I will get you guys updated. So yeah, it's pretty much simple. I couldn't be happier with this feisty hairdo. Thanks for getting through here! Oh yeah, I've been wanting to see how you did this! I got a Shakira head from Asia and her is straight, but kind of has a few kinks in it. To give her more of a Shakira look, I wanted to do this kind of hair style on her! Thanks! I will let you know how it works out! Oh, so sorry it took this long, Phyllis... But I'm glad you wanted to try it! I'm excited how your Shakira will turn out! This hairstyle looks fabulous on her! She's ultra chic now. You did an awesome job. Thank you, Vanessa! Yes, I love how chic she looked with this 'do... She was already gorgeous before, but I'm not very much into dramatic 'dos so... here she is now and I'm so happy! 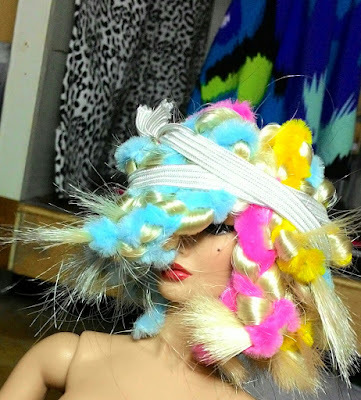 My friend wants to style her Barbie like Taylor Swift with curls. I showed her your photos and she said it's beautiful! Thanks for the tips. 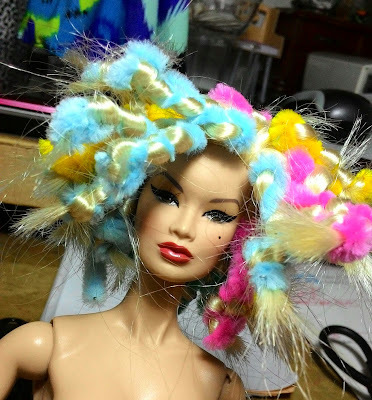 She said she will spend time curling dolls soon, lol. Ah yes, this hair indeed reminds us of the old Taylor Swift, way back her country music days ;) That's awesome your friend is trying those curls on her doll! Curls just really give our dolls some more edge! She is really very pretty like that. And in addition, with this superb denim shirt, she is a real beauty. Congratulations to you again Shasha !! Thank you for hair tutorial. I will try this one day. I like your doll's clothes. She looks nice in glasses. Cool idea, and seems pretty easy too! I'll have to try this sometime. Yes, yes, really worth trying! Planning to have some of my other girls work this too! I'm so glad you posted this tutorial. Hannari's hair is amazing and I'll have to try this as soon I have the right doll for it. ^^ Thanks so much!